Is it time for a home away from home? Buying a lakeshore home has different considerations than a primary residence. Here are insights you can use as you consider purchasing waterfront property in Minnesota or western Wisconsin. First, make a list of everything you want from your lakeshore home experience. Are you hoping to have a ski boat, or to spend your days fishing or kayaking? Do you want to be able to eat at waterfront restaurants you can travel to by boat? Do you want neighbors close by or something more remote? Start researching different areas to see what they offer, down to the types of fish in each lake. In addition to listing your preferred lakeshore home features, start ranking what’s most important to you. Whether you’re most excited about having a home large enough for visitors or living on a chain of lakes so you can spend all day on the water, ranking your criteria will help you narrow down your options. Once you’ve narrowed down your preferred area, find a REALTOR you trust and who understands your buying goals. 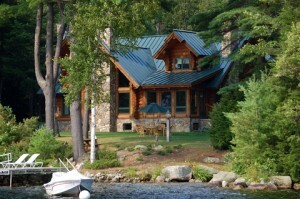 Your agent will be a trusted guide who can provide insights on the quality of the lake lot, elevation, lakeshore and the right types of lake and lake home or cabin. In an ideal world, the perfect waterfront property will already be listed, but it’s possible that your agent will have to help you over the course of a few months or longer to find the perfect lakeshore home for your needs. While it may seem like you can get a good idea of a home online, it’s especially important to see waterfront properties in person. Everything from the lake size to the home’s natural light to the shoreline and elevation to the lake is important to consider when buying a lake home — and almost impossible to gauge from even the most beautiful listing photos. Work with your REALTOR to block off a day or weekend to tour several lakeshore homes in your preferred area. Remember to go back to your ranked list as you narrow down your choices. Lakeshore homes, like any segment of the market, come in varying sizes and conditions. A buyer with an eye on a particular lake may want to overlook the updates required on a fixer-upper; conversely, a retiree may focus more on finding a perfect long-term home in good condition than one on a certain body of water. If you’ll need financing for your lake home, work with your REALTOR to get in touch with a mortgage loan officer who can walk you through your options. If this is will be your second mortgage, read these tips on securing a loan for a vacation home. Your real estate agent and mortgage loan officer can also help you factor in the costs of owning a lakeshore home, especially if this will be a secondary residence. Non-mortgage related costs include utilities, any homeowner’s association fees, repairs and winterizing services. By planning for these expenses in advance, you’ll ensure that your first year of memories as a lakeshore homeowner will be marked by coffee on the deck and sunset cruises to end the day instead of emergency repair calls. Once your offer has been accepted, it’s time to start planning for the future. If your lakeshore home will be a second property, you’ll need to buy duplicates of many home items including furniture, bedding, kitchen and bath towels, table settings, small kitchen appliances, cookware, cooking utensils and flatware. To keep costs down, pay attention to flash sales and visit estate sales or garage sales of other waterfront properties. Keep in mind that in some cases, lakeshore home sellers are willing to include furniture, décor and even their kitchen and dining items with the sale. This is especially common if the seller isn’t planning to purchase another waterfront home. Talk with your agent to determine if this is common in your local marketplace, and how you can incorporate this agreement into the terms of your contract. Many lakes, oftentimes depending on where they are located, have community meetings or neighborhood groups that discuss upkeep, water trends and testing and residential and commercial growth of the area. Not only will you learn more about the kind of community you’ll be moving into, you’ll also meet neighbors and new friends you can invite for happy hour or brunch once you move in. You’re about to enjoy your first full summer as a lakeshore homeowner, so make it count. Once your closing date looms, start researching local customs and festivals and make sure you’re in town for them. Visit the in-town bakeries, shops and restaurants and ask the proprietors for insider tips on the best places to boat, hike, fish and more. Soak it all in—you’re a weekend warrior now! Edina Realty has 2,300 local market specialists serving every neighborhood — and lake — across Minnesota and western Wisconsin. We’d love to put you in touch with one of the lakeshore specialists. Reach out today to get connected or start your lakeshore home search now.